There's hardly ever a bad time to visit Portland, Oreg. and as spring weather does its best to creep in, one of America's most revered convention halls is opening up. The Pacific Northwest as a whole has long since been a gem of the U.S., and Portland in particular has a wealth of beauty just a few short hours (or less!) away. In an effort to get you outside the boardroom and into the wilds of the Rose City, we’re offering up two restaurants, two attractions, and one bar that you can hit with just a few extra hours between meetings. Food is one of this city's strong suits. There are plenty of off-the-wall, quirky places to indulge, and you don't have to sacrifice quality to get an extra helping of the delightfully unusual. Take Le Pigeon, for instance. It's a high-end French locale just steps from the Oregon Convention Center, offering up some of the most beautifully prepared dishes this side of Paris. Of note, it's only open during the evenings from 5pm–10pm, so don't bother showing up for lunch. If you need to fill a craving earlier in the day, the recently opened Burnside Brewing Company is a solid bet. While brews are the focus, the extensive menu is shown a great deal of care, too. Best of all, things like grilled cheese and shrimp and grits are mainstays – a few items sure to ease the withdrawals of those visiting from the south. Let's be honest: You can't come to Portland and not make your way over to see the flora that makes this place so famous. I'll caution you not to simply pop "Rose Garden" into your smartphone and begin navigating; there's a sports and events venue in the city by that name, and oddly, you won't find fields of gorgeous flowers nearby. Instead, you'll want to hail a taxi when you find yourself with a couple of free hours and head to Peninsula Park. It includes the city's first public rose garden and first community center, a historically designated bandstand, and Portland's second oldest playground. 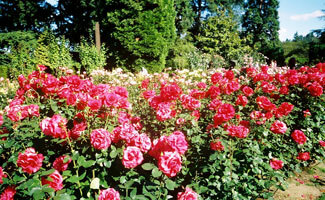 You can find various other public rose gardens as well, and if you own a decent camera, be sure to bring it along! For my second recommendation, it's of the choose-your-own-adventure variety. If you end up with a spare day in the city, be sure to rent a car and head either due east or west. The former will put you on Highway 26 headed to Mt. Hood, offering astonishing views and tranquility that's tough to beat. Heading west will eventually drop you onto Highway 101, offering expansive views of the underrated Oregon coastline. Driving even a few miles north or south here will have you overlooking oceanside cliffs that you could easily mistake for Ireland. Before departing, we'd recommend a quick saunter over to Spirit of 77. It's part sports bar, part eatery, and part arcade. To be honest, it's tough to find such a mishmash of venues anywhere in the country, and given its convenient proximity to the convention hall, you should definitely spend an evening checking it out. See our Portland destination guide for more trip-planning information.